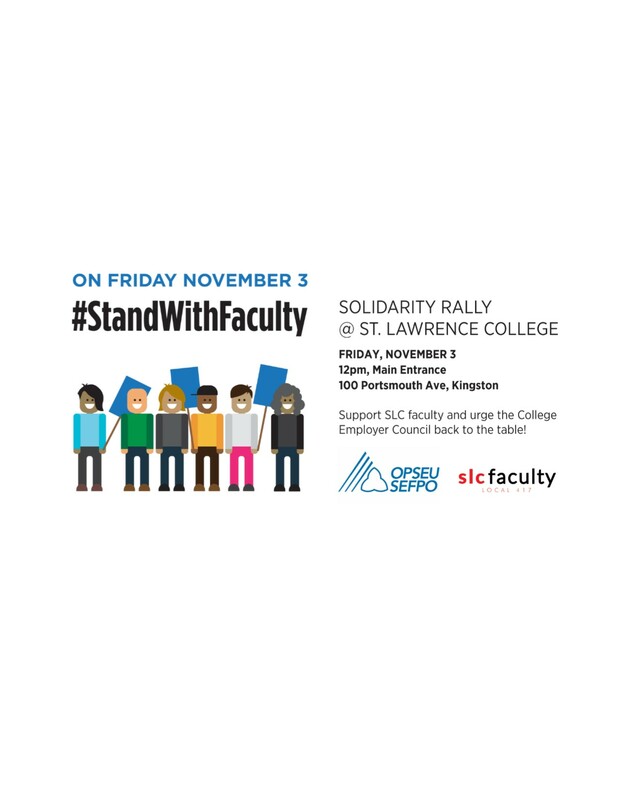 This Friday at noon there will be a rally at St. Lawrence College in support of striking faculty (see attached poster for details). The strike, now in its third week, is about the unsustainable reliance on part-time contract faculty who make up 75% of instructors on college campuses, about collegial governance and about academic freedom for college faculty. The College Employer Council (the administration) walked away from the table before the strike and has shown no signs of resuming negotiations. Please consider coming out for an hour to show your support for our colleagues and the principles they are struggling to defend, and to urge the College Employer Council back to the bargaining table. The Kingston District Labour Council has also organized a bus to take people to Toronto this Thursday, Nov. 2, for a midday rally at Queen’s Park in support of college faculty across the province. The bus will be leaving Kingston from the McDonald’s on Division near the 401, likely leaving around 7:30-8 am, and will returning from Toronto at approximately 2:30pm.